In the southern part of the friendly country of Belize lies a beach town with a knack for cheap happy hours, inexpensive good food as well as plenty of water based things to do. Placencia is a two street village that is about laid back as you can get. It is located at the end of a long peninsula with miles of beaches. Down here there are no chain or high rise hotels, Starbucks or KFC’s. There isn’t even a traffic light. What you will find are a few small upscale hotels along with mostly comfortable middle level efficiency type rooms or cottages. Here you will find good restaurants run by locals or a few ex-pats who decided to stay after being here a season. While Placencia’s prime activities seem like laying out at the beach and the beach bars, there are things to do for those that like to get wet. This includes snorkeling, diving, fishing, paddle boarding or kayaking. The scuba diving and snorkeling are world class being on the world’s second largest coral reef system. 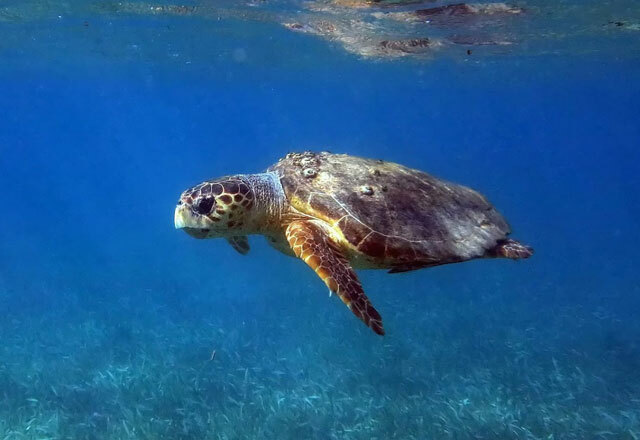 To see the reef, people arrange tours to take them to the reef islands overseen by the park’s department or to a privately run island with a lively beach bar. Our first outing to Silk Caye took one and a quarter hours to go 22 miles off shore to the outer reef. It can be a bouncy ride so if you are prone to sea sickness wear your patch or take the medicines that work for you. Once we were near Silke Caye the water smoothed out and we saw a picture perfect petite palm and sand fringed island. If you ever fantasized about being marooned on a tropical desert island with that someone special for a day, this is the place. Once at the island the snorkelers departed while the divers took the plunge nearby at North Wall. Fifty minutes later the divers joined the snorkelers on the beach for lunch and a swim followed by another dive at White Hole. The snorkelers were guided around the island seeing fish, rays and different coral. Diving here is easy as we followed our dive master Henry. This allowed us to concentrate on seeing the sea life. Along the way Henry would spear the occasional lion fish and try to coax anything down below to eat it. Lion fish are an evasive species here with no natural enemies. The local sea life is not familiar with lion fish and has no desire to eat them. Henry speared several lion fish keeping it on his spear to attract attention. By his second lion fish a five foot nurse shark sensed the injured fish and swam past me to have a look and take the snack. Another lion fish was waved near a hole where a large green moray eel showing its sharp teeth grabbed it in one bite. Getting sharks, eels and other species used to eating lion fish will help the reef system. Our dive had us swim on a wall that started at 60 feet looking down to the abyss. Here we saw a lot of soft and hard coral and many tropical fish. Our White Hole dive had a pretty queen trigger fish and additional nurse sharks follow us around. From the second dive the boat gathered everyone for a snorkel near Silk Caye where the fisherman clean their catch. Here we saw more sharks and a large loggerhead turtle. It was an exciting swim before the ride back to town. The next day we boated over to Laughing Bird Caye. This Caye has the advantage of being about half the distance as Silke Caye. Laughing Bird Caye is another little picture perfect island but is three times the size of Silk measuring 1.8 acres. This place has a shady area with hammocks and lounge chairs. Here I split my time with diving and snorkeling. The snorkelers saw rays, large parrot fish and coral. As Belize is country known for its jungles we took a boat ride on the Monkey River. Our captain Evaristo met us across from the Sea Horse Divers dock for the 30 minutes cruise across the bay to the river. Evaristo cut through the narrow mangroves to not only smooth out the ride but to get close to the frigate birds resting on the branches. He entered the river slowly to observe the wild life. This included monkeys, iguanas, birds, bats and crocodiles. After 45 minutes the boat stopped at an embankment for a jungle walk. During this time we viewed monkeys high above. To get them howling he banged his machete on a tree and howled at them. This got the monkeys to howl back. He taught us how monkeys travel, avoid other groups as well as their family make up. During out walk he poked his finger in a termite mound to get them to crawl out. He then put his finger in the hole and had a dozen climb on him. He explained how they work and that they are good source of protein as he licked them off his fingers. I found them tasteless. Just before finishing our jungle loop he discovered fresh jaguar prints. On the way back to Placencia the boat stopped alongside an island to view manatees. We recommend you reserve this tour a few days in advance, wear shoes, a hat and take along some bug repellent. One cloudy morning we took a short road trip north. 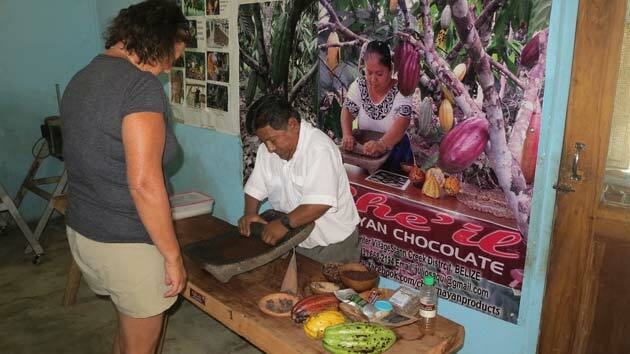 Our first recommended stop was to the Che Il Maya Chocolate factory at the Maya Center. As we missed breakfast we stopped about 100 yards north of them to purchase steamy chicken tamales for $2 BZE. They are delicious and as local a food as you can get. At the Mayan Chocolate Factory we met Julio who for six years has been teaching tourists with hands on experience how chocolate is made going from cocoa bean to chocolate bar. People get to hand grind down cocoa for processing before it goes in the molds. His store sells all kinds of chocolate products and byproducts like cocoa tea and wine. Email juliosaqui@gmail.com to make a reservation. We continued our road trip driving 30 minutes north to visit Marie Sharp’s hot sauce factory. (http://www.mariesharps-bz.com ) The free tour starts by tasting several different hot sauces, chutney and jams that they produce. Much of the ingredients come from Marie’s 400 acre farm. We were then given a 10 minute factory tour. Afterwards we visited the gift shop to try her fruit wines (not recommended) and buy a few bottles of her smoked habanero sauce. Marie is there every day and is known to come out and say hello. 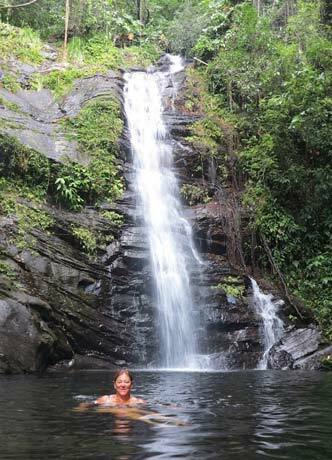 After hot sauce on a hot day it was time to head back and cool off with a refreshing plunge at the Pleasant Day Waterfalls. This falls is off the main tourist grid so we recommend visiting it sooner than later. It is located on a dirt road a couple of miles north of Santa Cruz at the modern Maya pyramid. To find it follow the Pleasant Day sign driving through the orange grove to the gate ignoring the zip line tour sign to the right. At the gate you pay $10BZE and drive to the left until you get to the end. Take the path to the right passing a couple of smaller falls before reaching a tall one flowing into a deep cool pool. If you sit at the side of the natural pool with your feet in you will be treated to the small fish pecking off your dried skin. Do try this. Some spas charge $15 for a 20 minute session for this treatment. Feel free to jump off the wooden ledge as the water is deep here. There is also a rock ledge at the bottom of the falls you can sit on. There are picnic tables at the falls if you bring lunch. Drive back taking the left road to reach a clearing for a view of the ocean in front and mountains behind. Placencia is a rustic looking village with two streets. The vehicle street goes to the docks at the end passing a few food markets, restaurants, shops and tour offices. You can park at the very end and walk west to two bars that hang over the water. The other street is really a walkway that the local web sites call the narrowest street in North America. This street runs adjacent to the beach. Here you will find various shops, cottages and small hotels along with a couple of popular beach bar / restaurants. There are good beaches to access from here. We recommend the following places for dinner. This includes the Barefoot Bar, Tipsy Tuna, Dawn’s Grill and Go, Merle’s Café. Dinners here cost on average $50 to $60 BZE for two. For upscale don’t miss the Mayan Bistro 15 minutes north of the village. This is Belize’s rated number one restaurant that we enjoyed twice. Do not miss Tutti Fruiti for the smoothest ice cream in town. Prices quoted in BZE dollars are two for every one U.S. dollar. Happy Hour is a passion and a competitive sport here. Our favorite bars were the Tipsy Tuna, Barefoot and Yoli’s over the water. We enjoyed aged local rum as well as Belizean vodka for for $5 to $6 BZE. A shot of local bitters was $1.00 BZE. Most bars have exotic tropical drink specials for $6 to $8 BZE with normal prices at $12BZE. Most places take credit cards but have cash ready in case the system is down. There are four ATM’s in the village. Tab Hauser is a journalist and travel advisor. His web site is http://www.tabhauser.com/.